The Diva's Weekly Challenge #204 is to tangle a Valentangle. This is my contribution. This ZIA was a nice weekend-job. I cut a piece of kraft paper and glued it on a white drawing paper. I like to draw on tanned paper, but can't find it here anywhere. Your work is always so lovely! I think that the light flowing feeling of this tile really captures the feeling of Valentine's Day and the entwined hearts are perfect. It's almost a little bit of Spring in the middle of yet another snowstorm. Thanks! Two absolutely gorgeous Tiles. Love the organic feel and lovely flow and color of each of you tiles. Very impressive. Both your tiles are really beautiful! And I think glueing the kraftpaper on white paper is a very creative and good solution. It looks great! I'm impressed by these. Both are really beautiful and so organic. Your Valentangle is very lovely and elegant. I love it. Your Zia is also beautiful on that tan cloloured tile. Beautiful pieces. There is a popular necklace that has hearts intertwined like you did, but yours is even nicer! Wow....your pieces are both stunning! This valentangle challenge has been wonderful to observe the gorgeous creations. I keep going back and forth and can't decide which I like better! Great job. My highschool German is a bit rusty but they seem to have several locations and an online presence. Maybe you can find your tan paper there. Although what you used worked perfectly! Wow! Das sind zwei fabelhafte Prachtstrücke! Dein erstes Stück ist so wunderbar leicht und fließend ... tolle Auswahl der Muster! Dein ZIA ist fantastisch! Sehr kreativ und sehr pfiffig der Übergang vom braunen zum weißen Papier ... das ist das sogenannte i-Tüpfelchen! Ganz, ganz wunderbar gezeichnet!! Ich bin begeistert!! 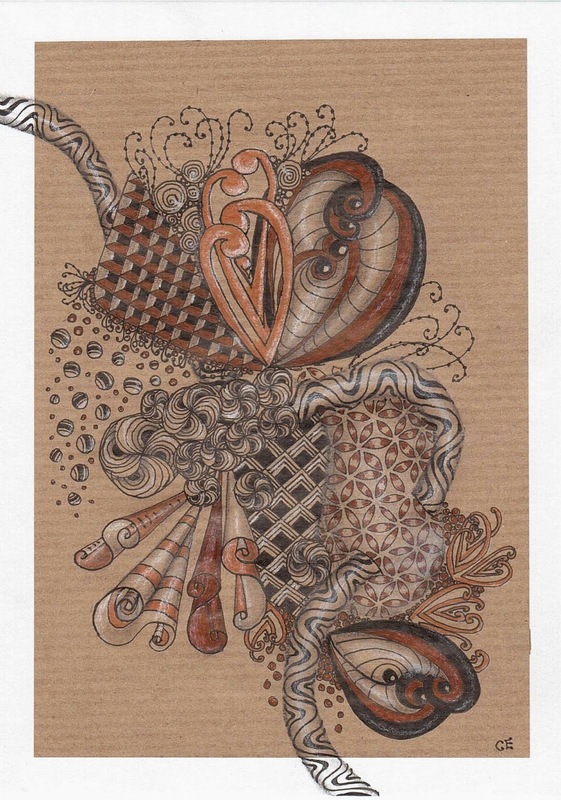 Beautiful flowing Valentange for the challenge and I also love the richness of your piece on the tan paper. Your Valentangle is so elegant and beautiful. Nicely done. I love your other tangle on the tan paper; I have always thought that tangles on the tan look fantastic and this is definitely fantastic! This is a beautiful piece. I love this. Very nice. Thank you. I love your Diva Valentangle!! It is so inspiring!! Your tan tile is lovely!!! 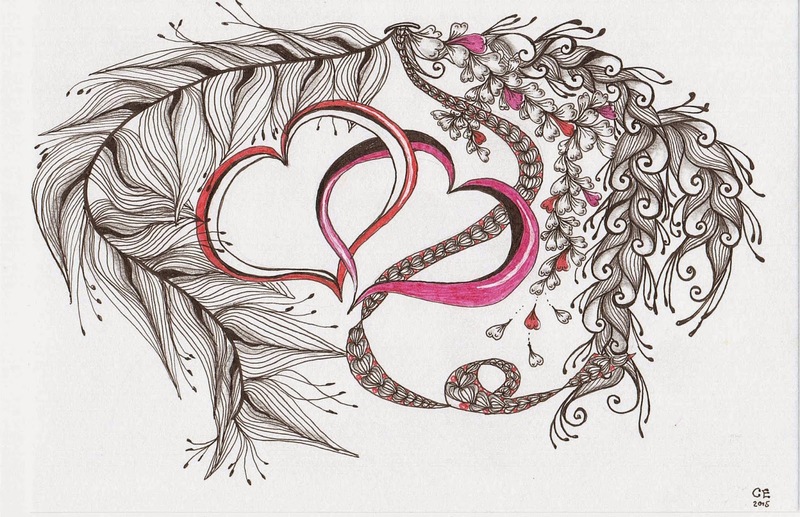 The Valentine one is beautiful, and the next one really catches my eye.